Lisa’s notes: If you’re looking for somewhere to stay that’s accessible to both coastlines and dog and child friendly then this is the place! Located in the quaint village of Lanivet, just 5 minutes from Barguse, this holiday cottage boasts all the luxurious features of a boutique hotel but with the freedom and convenience of self-catering. Lisa’s notes: For those who find the idea of self-catering too hard work, then there are some fantastic hotels in Cornwall!! However, as I’m basing these links on my own recommendations and where service is key, then I have to mention Watergate Bay Hotel. It’s a cool, contemporary place, with views and facilities to die for and also dog and child friendly. (That’s important to someone who has both!!) The rooms are beautifully decorated and like Lanneves Cottage has free wifi. Another important feature to me I’m afraid! 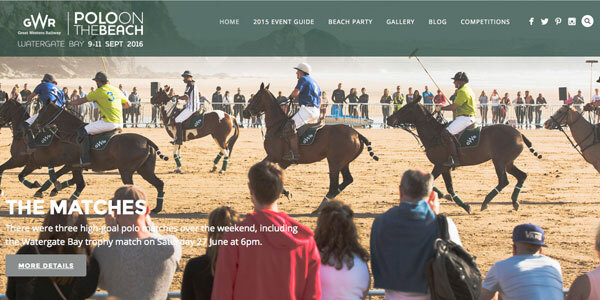 It’s famous for its stunning beach and holds the annual Polo on the Beach event each year. Sorry, couldn’t resist the horse link!! Lisa’s notes: If you want good quality food at a reasonable price than this local chippy is a definite! We have eaten here on numerous occasions as well as having plenty of take-aways. The food is freshly cooked to order and there is always plenty of it. Based in our local village of Lanivet, the staff are always friendly, the restaurant clean and they even cater for those who have gluten free requirements! This is a fun place to go to for a meal with a difference. My kids love the look of the diner with its large booths and vintage paraphernalia. The food is plentiful and features everything you’d expect from burgers, to pancakes and thick shakes. It has a great atmosphere and the kids are always kept entertained watching the comings & goings of the place. It does get very booked up so ring ahead at peak times!! Sams have various restaurants with different vibes across Cornwall. Each one is unique in character but consistent in offering great service and food. Sams of Fowey can be found in the heart of Fowey on the main high street. It’s got a brilliant ambience with its kitsch décor and the seafood there is fantastic. Their classic bouillabaisse is a must! You cannot reserve a table which means there are sometimes delays at peak times of the season but they do have a great bar & lounge above to help wile away the time! We also advise that you park at the car park as you enter Fowey and catch the town bus down as parking is very restricted close by. Alternatively, see it as a great way of burning off your meal by taking a stroll through this beautiful place! Sams on the Beach is another firm favourite. Based at the tiny resort of Polkerris, it is set in the old RNLI lifeboat station. It features beautiful views across the bay and offers a wide choice of food. As well as the customary seafood dishes that Sams is so famous for, they also have a custom built wood burning pizza oven that produces the most mouth-wateringly yummy pizzas. (My boys can testify to that!) Parking is restricted close to the place due to the nature of the location but there is a car park just a short walk away up the hill which is free to use! For one of the best carveries around then this place deserves a visit. The menus are decided on a daily basis depending on what food is in season locally and there are always at least three/four meats on offer. You can choose how many courses you would like and these offer great value for money as you can help yourself to as much as you like! You can choose between the restaurant for more formal dining or meal in the bar if you want a quick fix so to speak! It is child friendly and has attractive views across the golf course and with plentiful parking is one of those family friendly venues worth knowing about! My all-time favourite is a cream tea (I told you I never stop eating!) One of the best cream teas you can have is from the lovely Amy Long who produces the best scones and cupcakes ever. I know I’ve sampled loads!! Based in the beautiful village of St Just-in-Roseland by the sea, Amy has a cute little tea hut where she offers you the chance to relax, take in the view and sample her delicious cakes/cream teas or have a light lunch. The area is stunning with people travelling just to see the rare & exotic plants! She also makes the most amazing birthday cakes if like me you are too lazy/busy to do them yourself! !